This collection of essays brings together some of the greatest current Jewish thinkers to write about ten of the most innovative and inspiring leaders of the Jewish world in the twentieth century. The authors include; Rabbi Dr Meir Y. Soloveitchik, Dr Daniel Rynhold, Dr Yehuda Mirsky and Rabbi Dr. David Shatz. Their subjects include Rav Kook, Rav Soloveitchik, Rav Amital, Rabbi Norman Lamm and Rabbi Aharon Lichtenstein. (I chose to highlight these authors and subjects as I have been inspired by them over the years and did not mean to show preference over the other writers and thinkers). Each essay is written in a different style and often deal with quite complex ideas, however, the book is very readable and extremely enjoyable. One of the highlights of the book is the section dealing with Rabbi Joseph B. Soloveitchik (“The Rav”) and his brother Rav Ahron Soloveitchik and the American Constitution. Whilst the analysis is fascinating, it is a poignant, human moment which reveals to us so much about the characters we are learning about. Rav Ahron, we are told, read a letter from his brother, the Rav, from many years before. The Rav praised him for his excellent question and his having grown up (Rav Ahron received the letter when he was ten). After a wonderfully proud letter from his older brother, Rav Ahron tells us that his older bother “then proceeds to destroy my peshat (exaplanation).” Not only do we explore the ideas of these great thinkers, but we are privileged to enter into their private lives as well. Each of the essays in this book clarify how each thinker interacted with the world at that moment in time, and how they proved to be innovative. They acknowledged that their brand of Judaism did not deal with a particular challenge or problem and found ways to move forward. Whether it was the new approach to Biblical interpretation by Professor Nehama Leibowitz or the approach to Jewish Medical ethics by Rabbi Immanuel Jacobovits, Rabbi Herzog’s takkanot (new ordinances) for the state of Israel or Rav Amital’s development of the Hesder movement, each of these thinkers changed Judaism for all future generations. “…the questions asked by the Homeric Greeks are different from the questions asked by the Romans, that the questions asked by the Romans differ from those asked in the Christian Middle Ages or in the seventeenth-century scientific culture….The questions differ, the aspirations differ; the use of language, of symbols, differs; and the answers to one set of questions do not answer, do not have much relevance to, the questions of other cultures.” The questions that the Rav asked, and the challenges he faced, are clearly not the same as those that Maimonides had. Every one of the ten thinkers explored in this wonderful book heard the cry of their generation. The cry came from the emergence of the State of Israel and from advances in Medicine. The cry from a need to advance Biblical scholarship and from the challenge of Torah Jews living in a secular world and many many cries both open and hidden. This excellent book helps us to understand some of the greatest thinkers of the last century, and how they, not only heard the cry, but responded to it and bravely approached Torah through the prism of Western Thought. I have heard it said that if we all followed Rav Kook we would be Modern Orthodox Kabbalists! Over the past few years I have been inspired again and again by Rav Kook. His approach to all Jews, no matter how religious, his appreciation for art (see here) and his love for the land of Israel show us all how Judaism can be vibrant, modern, mystical and yet not budge from the path of Halakha and Masoretic Judaism. I was extremely excited to receive my copy of Rav Kook’s Orot as translated by R. Bezalel Naor (originally published 20 years ago and reprinted by Maggid Books last year). Having struggled to learn Rav Kook’s beautiful poetic writing for many years I was looking forward to learning this key text and develop my textual skills with the Hebrew and English presented side-by-side. As the Translator of this volume notes “Translating Rav Kook is no easy task.” The English only edition is available here and I have seen the bilingual edition in Jewish book shops in London including here. Amazingly, Rav Kook’s text feels as relevant today as it was when first published in 1920. Equating physical exercise with the recital of Psalms was seen by many as a step too far. I was therefore very pleased that this new bilingual edition does contain previously censored material. R. Naor writes a fascinating essay in his introduction to the book detailing the historical context of the work as well as the vicious attacks on Rav Kook, on the publication of the Orot. The tragic divisions surrounding Rav Kook’s ideas and the visits of the Gerrer Rebbe are presented in a fascinating and sometimes shocking manner. The breadth of Rav Kook’s write is astonishing, in Orot me-Ofel (Lights from Darkness) he deals with Christianity: The New Korahism (chapter 15) and the Role of Family and Cosmic Harmony (chapter 26) and Moses and Elijah: The Light of Torah and the Light of the Body (chapter 29). In Orot ha-Tehiyah (Lights of Renascence) he deals with wide ranging topics such as; Whole God-Knowledge (chapter 1) to a critique of Marx (chapter 10) and Halakha and Agadah (chapter 55). This review can in no way do justice to Rav Kook’s incredible and inspiring work. However, what is clear from the outset is that R. Naor has provided the English speaking community with an invaluable resource for us to begin (or indeed continue) the journey whose course Rav Kook set for us nearly 100 years ago. As an aside, I have found one other bilingual text of Rav Kook’s works very useful. Rav Moshe Weinberger’s translation and commentary on the Orot HaTeshuva is an extremely accesible work. Side-by-side hebrew and English with a commentary at the end of each chapter are fascinating and helpful in bringing another of Rav Kook’s works into the English speaking world. Details can be found here. At the time of writing three volumes have been completed and the fourth (and final) volume is due to be published shortly. I will be reviewing these volumes in the near future. Rabbi Brody’s book presents short halakhic (Jewish law) essays on a wide range of topics from Shabbat Elevators to Euthenasia, the question of riding a bicycle on Shabbat to Women’s Megilla readings. Each essay is very easy to read and understand and can be read in just a few minutes. Due to the concise yet entertaining nature of each essay it is very easy to sit down and decide to read one essay and find you have been there for an hour and read five! The book is a very good example of the author’s ability to present copious amounts of information in just a few pages. Complex topics such as fertility treatments cover a wide range of rabbinic questions and answers. In particular the section dealing with medical ethics is presented in a sensitive and caring manner. In his essay on Prayers for the Terminally Ill he concludes, “May God provide mercy and comfort to the terminally ill and their loved ones.” Far from being a cold presentation of various rabbinic opinions this book has a caring and considerate voice for those facing difficult questions. For those who are seeking to learn topics in more detail Rabbi Brody provides references for most of his comments. However, on a number of occasions, he does not provide a reference. For more advanced learning the book would have benefited from fuller referencing (e.g. page numbers) and a complete bibliography. For the English-speaking members of the Jewish community, or those who are not familiar with learning teshuvot (responsa) literature, this is a valuable and enjoyable addition to any library. For the more advanced students, there is also much to be gained. For myself, I have found that the essays provide a fascinating basis for many a Shabbat meal discussion with friends and family of all learning and religious backgrounds. Thank you Rabbi Brody. You can order it online here. Sotah – A new Tractate. Private ceremony or public humiliation? And so we begin a new Tractate today. Undoubtedly the idea of public humiliation of a woman due to the jealousy of the husband is worrying for many of us in the modern era. I am not sure if that is danger to women or danger posed by women, either way, this promises to be a fascinating tractate. Mazal tov to all who have finished Masechet Nazir today. In the Mishnah, Rebbi Nehora’i and Rebbi Yosi disagree about whether Shmuel ha’Navi was a Nazir. The Gemara which follows discusses a completely unrelated topic — whether it is preferable to be the one who recites a blessing or to be the one who responds “Amen” to a blessing. How is the Gemara’s discussion related to the subject of the Mishnah? Rav Ya’akov Emden (in Hagahos ha’Ya’avetz) points out that no other Mishnah in Shas records a statement in the name of Rebbi Nehora’i. Therefore, the Gemara finds this Mishnah as an appropriate place to record the Beraisa in which a statement of Rebbi Nehora’i appears. The Mishna and earlier Gemara may be linked with the topics of the permanent Nazir and the word Morah (Razor). The Gemara in Nazir (5a) cites another Beraisa in which Rebbi Nehora’i and Rebbi Yosi argue. Rebbi Nehora’i maintains that a Nazir Olam (permanent Nazir) may shave once every thirty days, and Rebbi Yosi maintains that he may shave once every seven days. That Beraisa should have been recorded here, because it is related to the dispute in the Mishnah which also discusses the topic of Nazir Olam. In fact, their dispute in the Beraisa may be the basis for their dispute in the Mishnah here. Rebbi Yosi, who rules that a Nazir Olam may shave every seven days, maintains that the words “u’Morah Lo Ya’aleh Al Rosho” (Shmuel I 1:11) do not mean that Shmuel was a Nazir who was forbidden to use a razor, because Shmuel — as a Nazir Olam — was permitted to shave once every seven days. Today’s daf touches on the remarkable Halakhic difference between Jews and Gentiles in the area of ritual impurity. The Talmud discusses the different burial positions utilised in the ancient world. One conclusion found in the Talmud is that if a Jew were to find a body buried in a sitting position then we could assume that this was a non-Jewish person and therefore no ritual impurity occurs. Here is a very long analysis of the questions, both philosophical and legal, arising from potential differences between Jews and Gentiles. It is a very comprehensive article and well worth the read. However, what is clear is that the vast majority of sources throughout the ages have emphasised the qualitative differences between Jews and Gentiles. I hope that many would find this unpalatable (at best!). However there is some hope. Two of the Rabbis (Rav Amital and Rav Lichtenstein) I have enjoyed learning from over the years express a minority opinion (and one that is certainly frowned upon in the above article) that there is in fact no difference between Jews and Gentiles. My feeling of discomfort is visceral when learning page after page of the Talmud with its use of the word ‘goyim’ in a derogatory sense. I personally find some comfort in the fact that this might be excused as an ancient text where it was important to have a clear dividing line between us and the other. From the time of Ezra the need to limit assimilation became a real problem in the Jewish world (as seen from the takanot of Ezra in the area of intermarriage). I can only believe that we were all created in God’s image, Jew and Gentile alike. We may have chosen God and/or He may have chosen us but that does not mean that there are any fundamental differences between us. Love for the other is so crucial in a world of violence and hate. In fact it helps us to build our personal relationship with God. 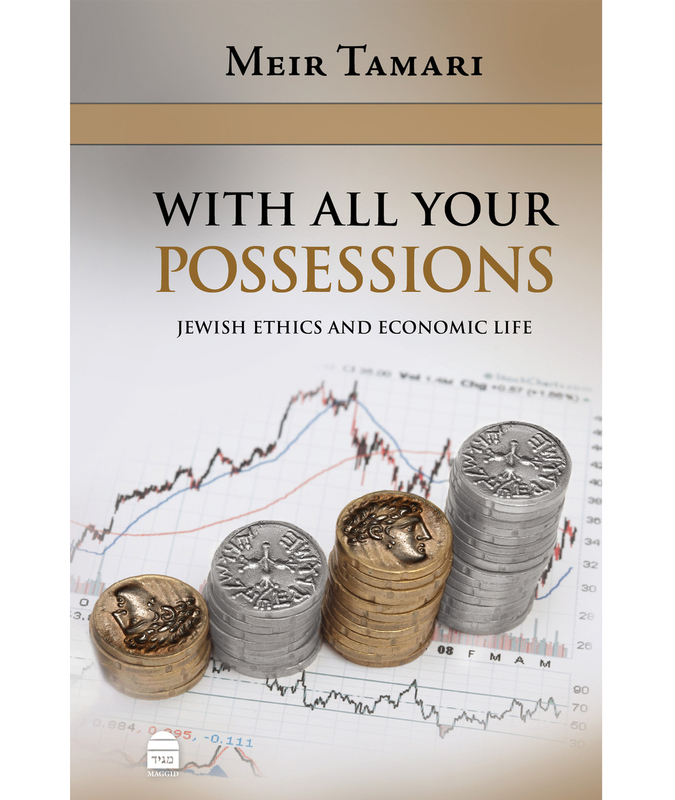 Meir Tamari opens this new edition of his book: With all your possessions: Jewish Ethics and Economic Life with the view that economics, both for Jews and non-Jews alike, needs to be approached in a fresh way in the 21st century. To put it in context, this new preface was written in response to the post 2008 global financial crisis. For those unfamiliar with how Jewish law works, Tamari begins the book with a useful overview of the history of Halakhic (legal) texts from the Bible up to the present day. Whilst this is a clear review of key texts and history, it would have been useful to include references in this section, as some of the traditional dates used by Tamari have been questioned by academics in recent years. However this is a small gripe in an otherwise well written and referenced work. Tamari deals with some fascinating issues such as, The Challenge of Wealth, Money, Banking and Interest and Taxation. However, one of most interesting sections is the one dealing with Environmental Issues and the Public Good. This is an area which is rarely written about in the religious Jewish literature. The section is divided into a discussion about damage caused by one individual on another individual, public health and town planning. According to Tamari “..the most important issue involved in contemporary environmental problems…striking a balance between urban growth and the ecological needs of society.” Whilst this is a short section of the book it highlights the, possibly little know, Jewish approach to the creation and maintenance of green belt land and the prohibition on changing the use of land. It may be impossible for us to imagine a world without huge cities, gridlocked traffic and pollution, however Rabbi Hirsch is quoted from his commentary on the Torah as teaching us that any growth in population or mobility that necessitated the construction of homes, factories, and offices would need to be managed by constructing a new city, with its own fields and common land. According to the British government “Good population health outcomes, including reducing health inequalities, rely not only on health protection and health improvement, but on the quality and accessibility of healthcare services provided by the NHS (National Health Service)(1).” However the cost of running the NHS has increased to astronomical levels. “When the NHS was launched in 1948, it had a budget of £437 million (roughly £9 billion at today’s value). For 2015/16, it was around £115.4 billion(2).” So what is the Jewish approach to the provision of Public Health? Interestingly, Tamari notes that, as in the case of the obligation to teach Torah with no charge, “the physician’s work was considered to be a service that was to be provided free of charge; after all, it was an obligation placed on the doctor by a divine source.” Whilst it is acknowledged that doctors can charge for their time (if not their expertise) the question remains, what is the Jewish approach to the provision of medical services to the poor? Yehuda ibn Tabbon told doctors that “while you take your fees from the rich, heal the poor gratuitously. The Lord will requite you.” Another option would be to raise tzedaka (charity) specifically to provide health care to the poor. This leads us to the issue of taxation (dealt with in an earlier chapter of the book). Whilst many will enjoy the custom of booing the name Haman in the Megillah on Purim, one of my favourite customs is to boo at the mention of the word מס (taxes) in the final chapter of Megillat Esther. However, Tamari paints a clear picture for us that taxation (even if it is often not named as such) is a very real part of the halakhic (Jewish legal) framework and has been present throughout Jewish history. Whilst the details may not be relevant to this review, the underlying message is clear. “Perhaps the most Jewish of the underpinnings of taxation is the now universally accepted concept of society’s responsibility for the needs of its members.” In fact one of the book’s earliest chapters deals with the “problem of wealth” however, its overriding message is that we must, of course look after ourselves, but just as importantly our neighbours, the orphans, the widow and the poor. The book is well written and very readable. It tackles subjects which may not be easily accessible to the English reading public. I very much hope that the author is planning a second volume in which he can expand on some of the key areas which he only touched on in this fascinating volume. Daf yomi Haiku style Fascinating approach to Daf Yomi – true b’kiyut!